Surfing the web, I found eFoxcity.com and this amazing ring. It’s the reason I decided to make my first Polyvore set. The ring is in the centre of attention, obviously. It looks rich, attractive and special! I love all details – red coral stone in the middle, turquoise and red crystals, amazing design, how it all fits together… I combined it with more expensive pieces, although the ring is still affordable. This is another reason I love it! 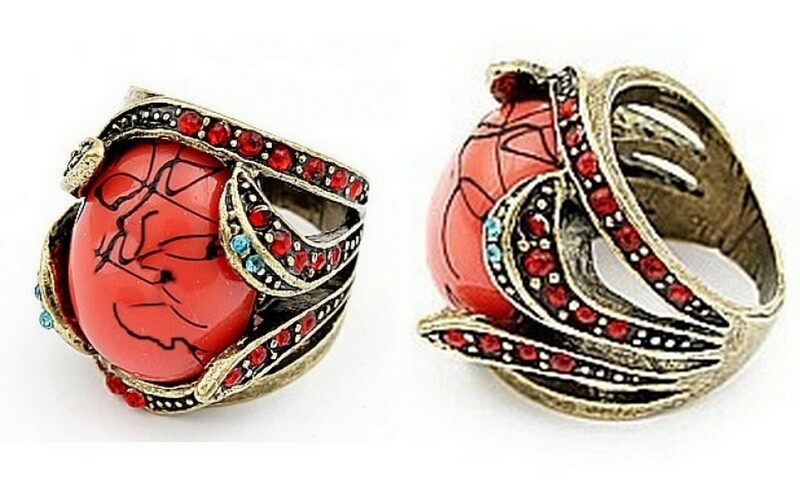 The Red Precious Stone Totem Set Auger Vintage Ring represents everything I adore about oversize rings. It changes an otherwise classic and a bit plane outfit into a more interesting one, with a vintage touch. Definitely on my wish list! What an outfit! Love it!Impressive blog! Hi pretty!! :) Just happen to pass by your blog! !And looks really interesting!! If you want you can take a look on my blog! !I'm a new blogger too!!!!! 🙂 We can follow each other! !What do you think??? 🙂 Just let me know your answer on my blog!!! I hope you'll get many more followers to read your nice texts and see your lovely photos!Just keep the good work!! Cool blog and lovely photos!!! wow, that ring is so unique. never seen a ring like that before. please write a review on it when you purchase it. i love this set as well. the booties are to die for. I never find a perfect pair but i love the pair thats on this post! Thanks for your comment and following my blog:) Hope you will continue visiting my blog, thanks! That collar necklace is fabulous! Great polyvore set girl! Love the booties:)! Great set! And the ring is gorgeous! Ohhh!! I love the booties!! Such a pretty ring! Lovely set!